I suppose we knew it would eventually happen. Toothpaste tubes have now been banned from certain flights because they can be used as explosive containers. So what alternatives are available if security bans toothpaste tubes from your flight? Older style toothpaste works better for toothpaste dots. 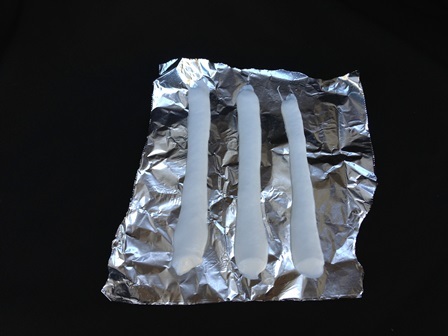 Test your toothpaste first to see if it will dry to the correct texture. Not all toothpaste is created equal when it comes to toothpaste dots. Some of the newer toothpaste gels never seem to dry out, making them unacceptable for DIY dots. I have found that the older “classic” toothpaste dries out better than the gels. 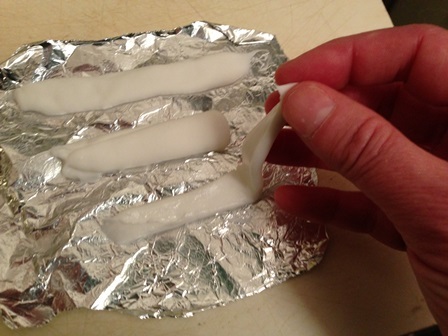 Experiment with your toothpaste by placing a few dots on a small piece of aluminum foil. Allow it to dry for a few days and test the consistency. 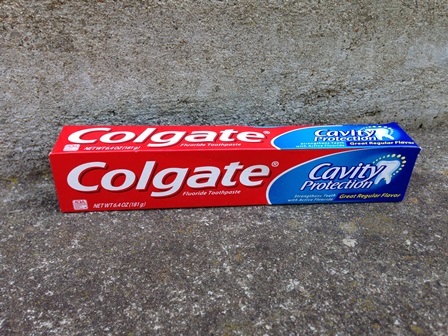 The toothpaste should dry out to the consistency of a piece of soft chewing gum. Air dry – This takes the longest, especially if the atmosphere has a high humidity level. Dehydrator- This is the quickest and most consistent method. Don’t dry your dots with another food unless you want that item to pick up a toothpaste taste. Poor man’s dehydrator. 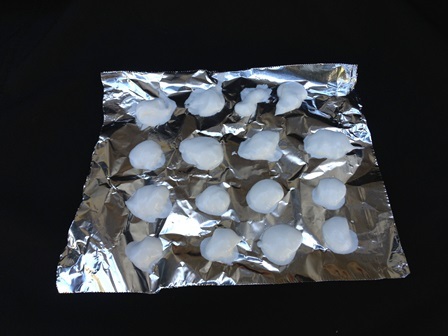 Place your dots on a baking sheet and place it on the dashboard of your automobile. A few days in the sun works wonders. It will also give your car a minty fresh smell. When I first stated making my dots I carefully tried to squirt just enough toothpaste on to the foil so I would have just the right amount in each dot. This took a lot of time to get right. I had a very difficult time controlling the amount of toothpaste as I squeezed it out. After some research I realized that I could squirt toothpaste into long lines or “logs” as though I were loading up my toothbrush. I could chop the logs up to the right size after they had dried out. Not only were the logs quicker to make, but I could control the thickness of the paste too. Perfectly sized dots are time consuming. 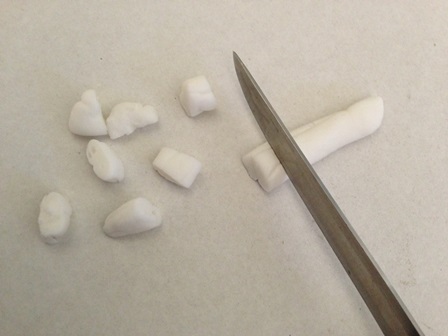 Squeezing toothpaste out into toothpaste “logs” is much easier than creating dots. I found that the logs I created with the toothpaste were a bit on the thin side. I fixed this by folding them in half when they were partly dry. The undersides of the logs were still sticky so I could “glue” the two sides together. Continue drying the dots / logs until they are the consistency of chewing gum. Peel the logs up when they are partly dry. The logs are folded in half, making them just the right size for toothpaste dots. Slice the logs up to “dot” size once they have dried out. Each person knows how much toothpaste they like, so cut as you see fit. My dots are the size of an average pea. Coat each dot in baking powder. This will keep the dots from sticking to each other while they are in storage. Chop the logs up to dot size. 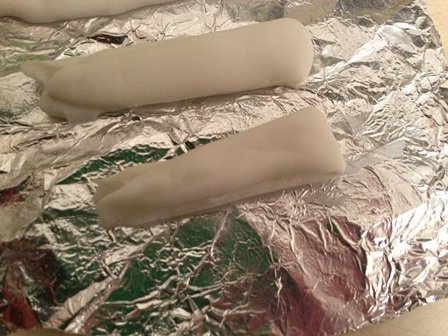 Coat the dots in baking powder to keep them from sticking to each other. 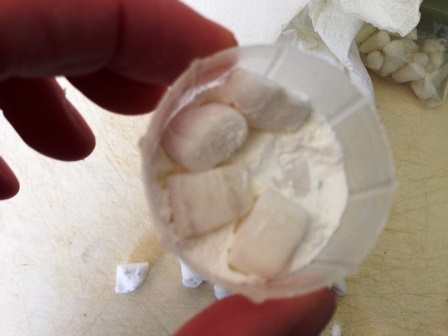 Once I have coated my dots in baking powder, I store them in a small pill container or zip-lock. I usually count out around 20 per bag, and use one bag per week. I store 2-3 bags in my toilet kit, one for each week. Use a small pill bag for storing the dots in your toilet kit. Step 7 – Brush away! Toothpaste dots are easy to use. Pop one in your mouth and chew it up like gum. Try to chew up any of the larger chunks of toothpaste. Insert your toothbrush and brush away. I found that dots foam up more than regular toothpaste, especially if I use extra water. I don’t mind too much – the important thing is to get clean teeth without gagging. DIY toothpaste dots are quick and easy. They are a great lightweight alternative to liquid toothpaste. While I still prefer regular toothpaste if I can get it, these dots are great for light travel. Edit: Sept 28 2016 – Clarified that toothpaste dots should be pea sized as there was confusion on the size. Absolutely love this idea. Even if you can pack toothpaste it means you can only take as much as you are going to use. Great idea! Why baking powder instead of cornstarch? I might try this for our next trip. And they sound perfect for backpacking, too. Corn starch contains glucose, which is bad for teeth. Baking powder is neutral and actually whitens teeth. Baking powder is actually a mixture of baking soda, cream of tartar and cornstarch. Cream of tartar is an acid, not so great for teeth. The mixture of baking soda and tartar can cause enamel erosion, which can further lead to teeth hypersensitivity and it can cause cavities or worsen the small ones. The tube show up on their scanners. If the little bags showed up we might have the same problem. That’s what so sweet about the dots – as “solids” they are less likely to be inspected. I’m not sure of the whitening aspect of baking powder but baking SODA is definitely whitening and is actually used in many oral products. I brush with it alone occasionally to whiten my teeth. Wouldn’t that make more sense? Baking soda and baking powder have many of the same ingredients. Soda is basic, where powder has cream of tarter added to it to make it neutral. Soda has a slightly bitter taste to it. Both will work, but powder is neutral. Very interesting. I suppose the baking soda is what makes the dots foam up. I’ll have to give this a try. Thanks for posting. There is a product called Toothpaste Tablet by Archtek. http://www.toothpastetablets.com. We have been using them exclusively on all our trips for several years. They are on the expensive side but theya re worth it. I buy them directly from Archtek online. A hint: if you buy the multi-bottle set you can get two bottles worth into one bottle by shaking them around. Thanks for your insight Monte. I tried the Lush toothpaste tabs and wasn’t impressed. The Lush tabs broke up into chunks in my mouth and it was hard to brush. Cindy, Its good to hear from you. I’ve tried to guide as many women as I could to your site. Thanks Monte, it’s always a compliment when I get help from experienced one bag travelers such as yourself and Sharon. Making a toothpaste dots is an excellent idea. This is convenient since it will give me extra time in having a rest than finding toothpaste after landing. I wonder if I can make toothpaste dots out of organic toothpaste. I just hope that the consistency and cleaning will be the same too. I have never tried it with organic toothpaste. How about an experiment with 5-10 dots? I’ve found that the consistency from regular toothpaste is slightly different, but not enough to bother me. Does anyone know what is the best brand of toothpaste to use? See my note above. 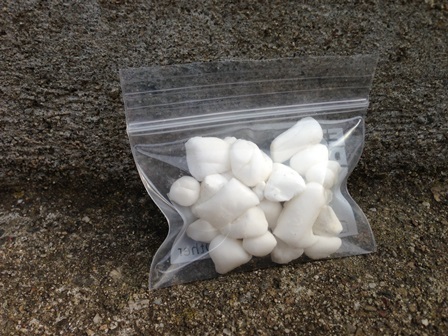 Try Archtek Toothpast Tablets. : wwwtoothpastetablets.com. Get them direct from the company or Amazon. Monte’s advice is good. I’m not a fan of Toothpaste Tablets myself (it’s a texture thing). For the article above I used the Colgate Protection, which is a paste, not a gel. That’s true, the texture of the tablets can be offputting. You have to chew them up without swallowing before you start brushing and they are kind of grindy until you get a good brushing going. Thanks for this super idea! Definitely gonna try this! Yuk! I don’t even use deoderant because my body doesn’t need any more aluminum. I also don’t use toothpaste because my body doesn’t need fluoride. I use milk of magnesia for deoderant, no purfume no smell no burn. I also brush my teeth with it, my teeth have never been this white, and no more sensitivity. It works because it contains sodium hypochlorite (AKA bleach). Yes, bleach. What a great idea! I wanted a solution to stop using plastic tubing and storage bags, so I’m going to see if this works with homemade toothpaste and put it in a glass jar. Thanks for the idea!